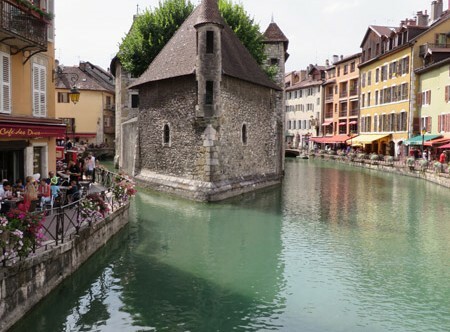 I’ll admit I hadn’t heard of Annecy until about 3 days before we went. A friend told me to go and after that I kept seeing it pop up everywhere. So off we went. Boy was it worth it! Annecy is in the very east of France on the Swiss boarder, near Geneva. The drive in and out is stunning and it is possibly the prettiest little town I have been to in France. Everywhere you go you are faced with beauty. It is set on a lake that is surrounded by picturesque mountains and edged with cottages, greenery and flowers. The township is set on little canals and despite there being tourists everywhere, it is still beyond charming. There are street performers, gelato shops, cafes that spill out onto the streets and best of all, the sun was shinning. What was not to like? The kids had an icecream while we wandered through the alleys and around the canals. I loved all the flowers in hanging baskets and pots around each restaurant. To top things off there is a giant park/garden right near the main part of town. Inside is a boating area, beautiful old trees and gardens and best of all two fabulous playgrounds for kids! Our boys played for hours here and had an absolute ball. The playground was clean, well maintained and fenced. It was also really interesting and had lots of challenging equipment for them to play on including a telescope for Tom (he has a fascination with telescopes). We only had a day here, but I would come back in a heart beat! Next time I would stop for a few days and perhaps spend one of them just laying on a blanket in the park! We just visited Annecy and like you thought it was absolutely beautiful. We were in Bern deciding where to go next and were a bit over how expensive Switzerland is. So at about 10pm we bought train tickets to Geneva for the following day, and as soon as arrived we immediately caught a bus to Annecy. One of the best decisions we’ve made on our travels so far. It was one of our best side trips as well! It was just so pretty! Next time I will try and stay for a few days!